Looking good comes at a cost. Women often go through great pains to pluck eyebrows, remove unwanted hair and strut around in high heels. Another beauty pain: teeth whitening. Whitening your teeth is not as painless as it sounds. Strips, gels, mouthwashes and toothpastes often contain peroxide, which can make teeth sensitive. Nothing is worse than the tooth pain you experience from drinking ice water or coffee. The good news is that even if you have sensitive teeth, there are still ways to brighten your smile at home without paying your dentist hundreds of dollars. There are products specially formulated for sensitive teeth, so you can brighten even the dullest mouth in the comfort of your own home. If you’re tired of dealing with stained and sensitive teeth, here are some products to consider. Most people with sensitive teeth tend to avoid whitening strips because they require a long application time. Peroxide is the most common ingredient in teeth whitening products, and when peroxide is left on the teeth for a long period of time, it can cause extreme sensitivity. 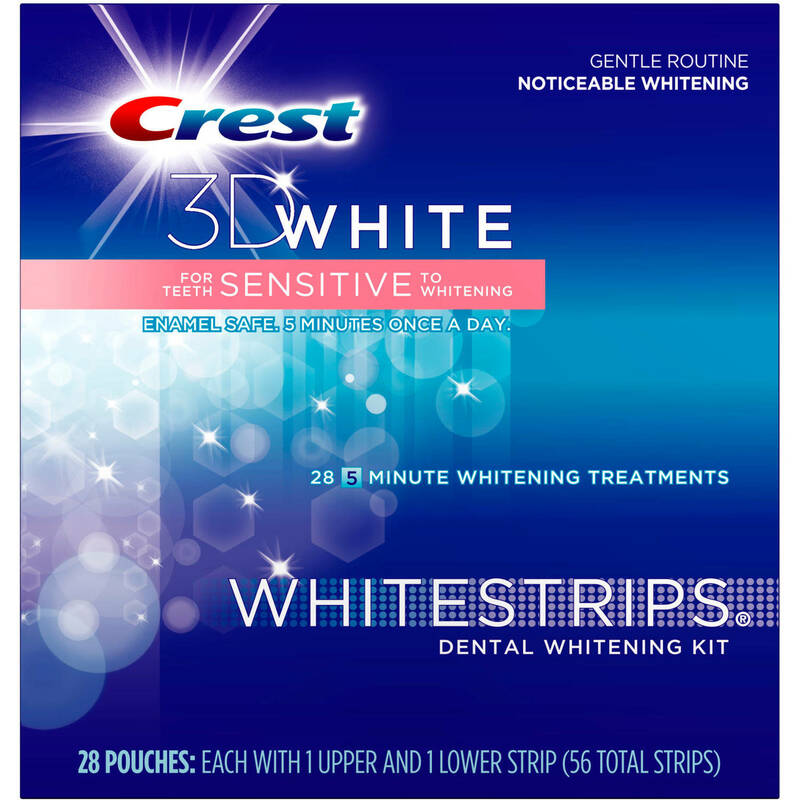 Crest 3D White Gentle Routine Whitestrips are different, as they are specially formulated for sensitive teeth. Crest 3D White Gentle Routine Whitestrips use enamel-safe products – the same ones that dentists use – to gently and gradually remove stains from your teeth. They can remove years of stains from coffee, wine and smoking to reveal a more gorgeous smile. Whitening strips are often messy. They rarely stay in place the entire time, resulting in a less-than-ideal teeth whitening experience. Crest 3D White Gentle Routine Whitestrips are made with Advanced Seal™ Technology, which offers a no-slip formula. The strips mold to your teeth, so there’s no slipping or sliding. They are also easy to remove. For best results, use Crest 3D White Gentle Routine Whitestrips for 30 minutes a day for 14 days. You can eat, walk, talk and even drink water while wearing them. At around $45, Crest 3D White Gentle Routine Whitestrips are a bit on the pricey side, but users love them and say they are well worth the cost. The Luster Pro Light Dental Whitening System offers a professional-grade whitening system for just $44. Featured in People magazine and Allure, this teeth whitening system helps your teeth turn back time. In just a half hour, it can erase years of stains caused by wine, coffee, tobacco and aging. The Luster Pro Light Dental Whitening System uses the same technology your dentist uses, but for a fraction of the price. In fact, it was developed by dentists to help you achieve a bright, white smile. Even if you think your teeth are white enough, this set can take it up a notch. It can make your teeth up to six shades white. It is enamel safe and creates zero tooth sensitivity, so you can brighten your smile painlessly. Even after multiple uses, users experienced no sensitivity. The Luster Pro Light Dental Whitening System comes with everything you need to professionally brighten your smile. You’ll get AcceleRinse to pre-treat teeth, a whitening serum that contains active dental peroxide, a dual-action whitening light, a quick-reference guide, a shade guide and batteries. The Aura Glow Deluxe Home Whitening System is another professional-grade system that uses a light to speed up the whitening process. For just $60, you get noticeable results after one 30-minute treatment. 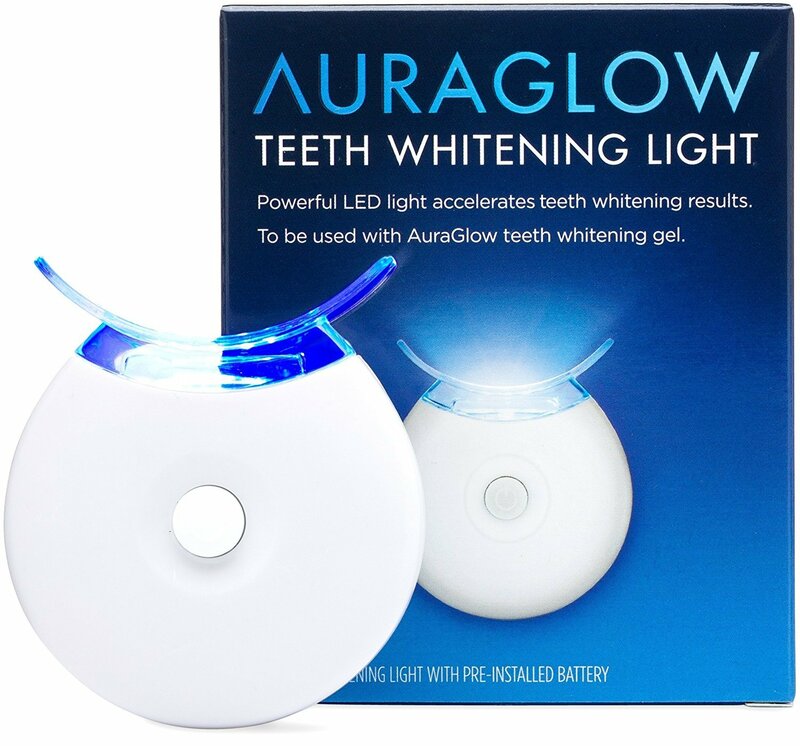 The Aura Glow Deluxe Home Whitening System contains a powerful LED light with a built-in timer and beeper to help you keep track of your treatment time. The two included whitening syringes contain 35% carbamide peroxide, enough to last for 20 sessions. The tray molds to fit any mouth and allows you to whiten both your top and bottom teeth at the same time. The Aura Glow Deluxe Home Whitening System continues to whiten teeth with each use. Repeat for up to 10 days until your teeth reach the shade you desire. If you’re not big on using syringes and mouth trays to whiten your teeth, try something simpler: like a pen. Tarte Pearly Girl Vegan Teeth Whitening Pen allows you to brighten your teeth anytime, anywhere with a portable, easy-to-use pen. It instantly brightens teeth while boosting enamel. This pen is free of bleach, so it works well even on the most sensitive teeth. You can now whiten your teeth without pain. Tarte Pearly Girl Vegan Teeth Whitening Pen uses a soft-bristle brush to apply the whitening gel to the teeth, so you get an easy application without the mess. This pen’s ingredients include a patented calcium complex that breaks up stains while adding a refreshing mint flavor. You can use it up to four times a day. This 4 ml pen is $22. Activated charcoal is the hot new trend. It’s great for a variety of health and beauty uses. Did you know you can use it to whiten teeth as well? 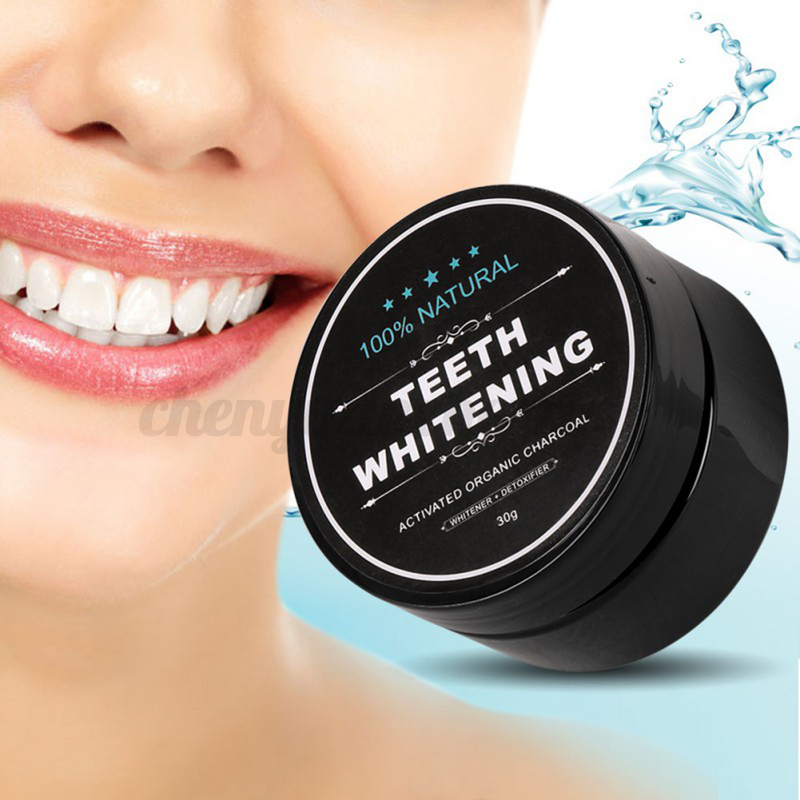 Activated Charcoal Teeth Whitening Powder with Bamboo Toothbrush naturally whitens dull or stained teeth without harsh ingredients. Using activated charcoal is safe and easy. Just dip the included bamboo toothbrush into the charcoal powder, brush your teeth as normal and rinse out your mouth when you’re done to remove the excess charcoal. Use it twice daily for 30 days for best results. Activated Charcoal Teeth Whitening Powder with Bamboo Toothbrush remove stains without causing pain to sensitive teeth. It is safe for enamel and freshens breath with its peppermint flavor. A 20 gram container costs $25. Whitening toothpastes claim to whiten teeth after regular use, but most don’t create lasting results. Supersmile Professional Whitening Toothpaste is the exception. It was created by Dr. Irwin Smigel, who is known as the “Father of Aesthetic Dentistry.” Supersmile Professional Whitening Toothpaste is made of Calprox®, a scientific formula made of calcium peroxide and minerals. This ingredient removes bio-film from teeth without sensitivity. 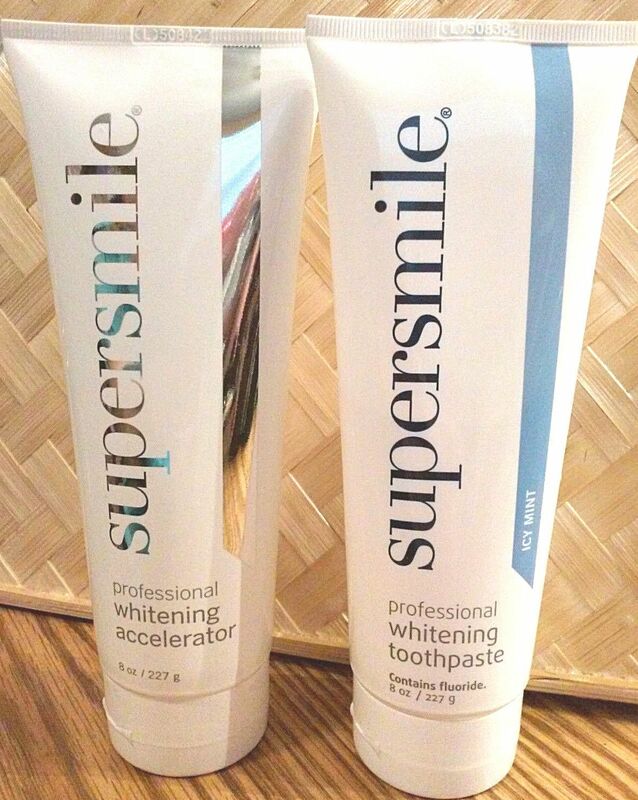 Supersmile Professional Whitening Toothpaste removes plaque 10 times better than regular toothpastes and can whiten teeth up to six shades. It can even restore dentures, veneers, caps and bonded teeth to their original shade. It also removes stains caused by coffee, wine, tea and tobacco without harsh abrasives. Fluoride, calcium, magnesium and phosphates fight cavities and restore enamel. A 4.2-ounce tube of Supersmile Professional Whitening Toothpaste costs $23, which may seem expensive for toothpaste. But this is no ordinary toothpaste, and you’ll see noticeable results, and that alone is well worth the cost. If you’re a gum chewer, keeping your smile bright has never been easier. Also made by Supersmile, Supersmile On-The-Go Whitening Gum keeps your smile white, bright and fresh even when you are on the go. No trays, no lights, no peroxide – just regular gum with whitening ingredients. You’ll never have an excuse not to whiten your teeth. Supersmile On-The-Go Whitening Gum has the same Calprox® formulation found in the Supersmile whitening toothpaste. Sweetened with 65% xylitol, this gum contains no artificial sweeteners. It safely and easily cleans teeth. Just chew it like regular gum and after a few uses, you’ll notice whiter teeth. A pack of 12 pieces of gum will set you back $5. Grab a couple packs so you always have this gum on hand. It’s great for freshening teeth after a meal. 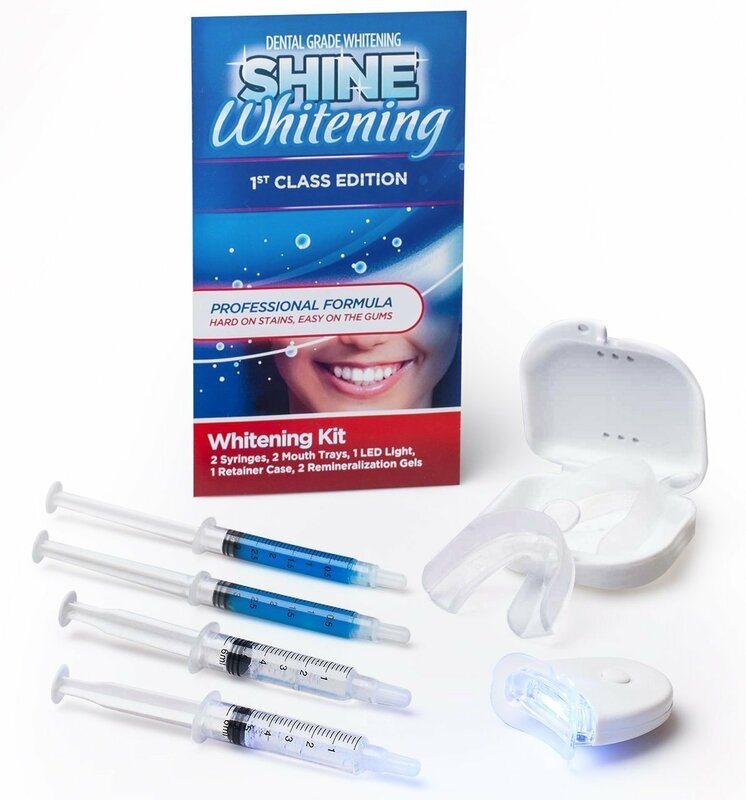 Shine Whitening is a tray-based whitening system that uses no peroxide, resulting in virtually no sensitivity. The secret is the included LED light, which speeds up the whitening process. This kit includes easy-to-use trays that mold to your teeth, syringes, an LED light and a formula that is made of botanical agents to whiten your teeth without pain and sensitivity. The trays are easy to use and make the whitening uniform across your mouth so you don’t end up with splotchy teeth. For just $20, the Shine Whitening system is a bargain. It works just as well as the trays that dentists use, but for a fraction of the price. Try it for yourself and you’ll enjoy the enhanced brightness. Teeth whitening products allow you to brighten your smile at your convenience. Today’s products are so professional-grade and advanced that you won’t have to schedule any more expensive trips to the dentist. You can make your smile several shades whiter by simply using the products listed above. Hydrogen peroxide is the most common cause of sensitivity. If you have sensitive teeth, avoid using products that contain high levels of peroxide. Shorter application times (five minutes or less) can also help. After whitening your teeth, avoid extremely hot or cold beverages for a few hours until your teeth get used to the formula. Drinking these types of beverages will only make the sensitivity even worse. Don’t suffer from tooth pain alone. It’s important to discuss your teeth sensitivity with your dentist. He or she can recommend appropriate products.